Rajasthan's Naib Subedar Bajrang Lal Takhar and S. Shakir Ali has been named for the Padma Shri award 2013 on the eve of 64th Republic Day. Indian Rover and Naib Subedar in Indian Army, Bajrang Lal Takhar who won the first individual rowing silver medal for India at the 2006 Asian Games held in Doha and Shakir Ali who is Mugal and Parisian Painting expert has also won National award in year 1993 and now conferred with Padma Shri Award 2013. 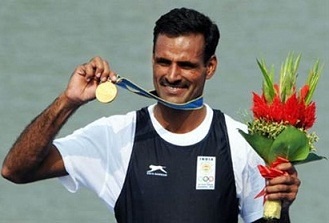 Bajrang Lal Takhar born on 5th January 1981 in Sikar district, Rajasthan is an Indian rower who won the first individual rowing Gold medal for India at the 2010 Asian Games held in Guangzhou. Takhar is a Naib Subedar in the Rajputana Rifles regiment of the Indian Army. Bajrang Lal won the first individual rowing silver medal for India at the 2006 Asian Games held in Doha. He contested in the men's single skulls rowing event at the 2008 Summer Olympics in Beijing, but failed to reach the finals. He finished with a rank of 21. 81 people wins Padma Shri Award 2013. Padma Awards, the country’s highest civilian awards, are conferred in three categories, namely, Padma Vibhushan, Padma Bhushan and Padma Shri. The awards are given in all disciplines/ fields of activities, viz. art, social work, public affairs, science and engineering, trade and industry, medicine, literature and education, sports, civil service, etc. ‘Padma Vibhushan’ is awarded for exceptional and distinguished service; ‘Padma Bhushan’ for distinguished service of high order and ‘Padma Shri’ for distinguished service in any field. The awards are announced on the occasion of Republic Day every year. The awards are conferred by the President of India at a function held at Rashtrapati Bhavan sometime around March/ April.